Cut, the start, and proceed to end things from falling apart! Uthi yebo indima uyidlalile kepha eyami impi namhlanje eyani? Ngikuvezele imicabango yami, ngesimo sami,nginike ithuba nendlebende ngisike ububende! Vimbani nakhu kuchitheka igazi, nibe nazi! Ngoba ngiyamazi owangichithela elakhe igazi kuze ngizazi! But the truths always diminish or vanish lies with or without a clue! Have I got your head nodding? These things happen, thus we sometimes see you fall apart! Why things fall apart, but the great art is to rise from the ash and pave your dash! For I stand for the truth that cowards will sell for bread, even when I’m dead! This poem is an ode to greats that have questioned societal norms. The poets speaks about Chinua Achebe – an African literary hero, Steve Biko – an anti-apartheid activist in South Africa. He calls for this current generation to stand up for their believes the way these veterans did. 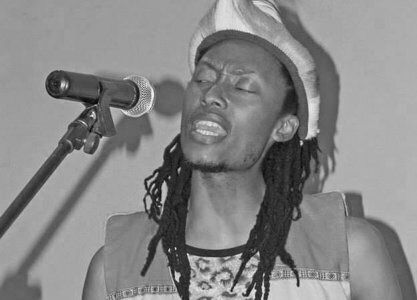 Stylistically, the poet uses a lot of Zulu click sounds to play with words poetically – a style he is known for. akekho okhuzayo umakuchithwa igazi akekho obuzayo kunaloko kudlulwa ngathi amathuna. Kodwa umangifunda lenkondlo yami kunethemba lokukhanya elivelayo elingathinta lishintshe izihliziyo zabaningi. Born in 1981 in Hammarsdale just outside Durban, Hector S Kunene first journeyed into poetry at the young age of 16 and immediately his love for his art emerged. It was his love for poetry that saw one of his first poems Bloody Corpuscles published in the Sunday Times newspaper. Hector later moved to Bloemfontein where he pursued his childhood dream of publishing a book because “I want to see people reading, I want people to start appreciating poetry again like they did in the days of Don Mattera and the likes of Mzwakhe Mbuli and Keorapetse Gkositsile”. His first book Through The Tunnel released in 2010 not only received exceptional reviews but was also internationally recognized. He went on to publish a literary study of Omoseye Bolaji that same year which as well was well received by literary pundits, newspapers and numerous other local publications. The successes of both books resulted in him being awarded the Free State Writer of the Year award in 2010 in addition to the Free State Department of Sports, Arts, Culture and Recreation purchasing his works for libraries across the province. Hector, who additionally serves as a Manager at SAA’s Airchef’s division, was also billed to perform at the Howick Writers Festival in Durban and was honored by Darrel David for Midland Literary Festival and Boekbedonner in the Karoo to name but a few. With a third book in the pipeline, the literary protégé is bound to receive further acclaim. The rising star, who has even learnt other languages in order to resonate with his audiences, sites Dr. Don Mattera, Keorapetse Gkositsile, Napo Mashiane, Jah Rose, Lebo Mashile, Gcina Mhlophe and QwaQwa native Kwazi as his sources of inspiration. His unique traditional poetry style laced with inspirational spiritual messages has undoubtedly endeared him in the hearts of his followers. “This is what I live to do. I worship God with poetry. I long to see the church appreciating God in Poetry. I yearn to see young children play in the rain singing ‘Re Ne Sa Pula’. I would love to see the libraries filled with our books and us being celebrated all over the world for doing what we love”.